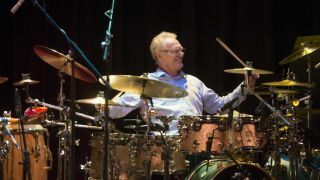 Ginger Baker achieved immortality when he formed the original supergroup Cream in 1966, alongside bassist Jack Bruce and guitarist Eric Clapton. He pioneered the use of double bass drums in rock music, particularly on his monumental solo, Toad. The 2005 Cream reunion shows were something that few believed would ever happen, but it turned out to be a great success. Ginger was playing better than ever, his silver glitter Ludwigs having been replaced by a modern DW kit of a similar set-up but in a smaller size. "Green lacquer with gold fittings"
"Ginger's kit is a DW in green lacquer with gold fittings," remembers the tour's tech was Yard Gavrilovic. "His main bass drum is 20"x12" and his left one is 22"x12. The shallow bass drums were specially made for him." "His snare is a 13"x5 1/2" DW Craviotto and I got a spare because if anything happens during the gig you want something you can just slot in without having to mess about changing stand heights. He also still has the 14"x6 1/2" Leedy that he used in Cream. It's taken a fair old hammering." "He uses two DW 5000 kick pedals and a hi-hat with no legs that clamps to the left bass drum hoop. He doesn't like too many cymbal stands, so there are three in total and little arms which all clamp off each other. Ginger's cymbals are all Zildjians, some of which date back to Cream, including his 14" hi-hats and 22" K ride with 12 rivets. "He also has an old 13" bottom hat that he sometimes puts on top of the 13" floor tom and whacks." "The bass drums have single-ply DW heads with full front heads. Damping is a little DW pillow which just touches both heads. He uses the felt side of the DW beaters with no impact pads. The main thing is he loves that open sound, no muffling. He wants them to sing, as he puts it." "He taught me this technique where he hits the floor tom and then works his way up and taps the snare drum with the snares off so the drums are all in tune with each other. He'll work out the tension of the snare from how the toms sound." "The snare is fairly low, a fat sound. The bottom tom heads are tuned a quarter turn higher than the tops. His main thing is the snare and he leaves the toms to me. He'll say, 'I don't really care how often you change the toms as long as you leave the snare alone'."